Brooklyn Museum Seductive Subversion: Women Pop Artists, 1958–1968 October 15, 2010–January 9, 2011 Elizabeth A. Sackler Center for Feminist Art and Morris A. and Meyer Schapiro Wing, 4th Floor This large-scale exhibition examines the impact of women artists on the traditionally male-dominated field of Pop art. It reconsiders the narrow definition of the Pop art movement and reevaluates its critical reception. In recovering important female artists, the show expands the canon to reflect more accurately the women working internationally during this period. 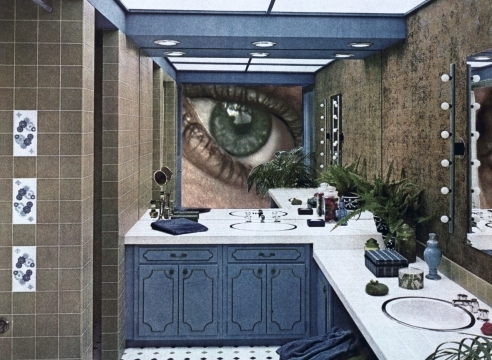 The exhibition features more than fifty artworks by Chryssa, Niki de Saint Phalle, Rosalyn Drexler, Marisol, Yayoi Kusama, Jann Haworth, Vija Celmins, Lee Lozano, Marjorie Strider, Idelle Weber, and Joyce Wieland, among others. 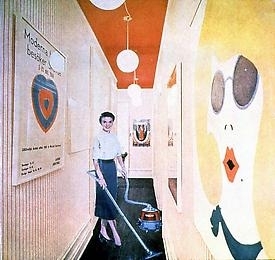 MARTHA ROSLER "Vacuuming Pop Art," 1966-72 Photomontage 24 by 20 in. 61 by 50.8 cm.